In 2012, the Scottish Rite engaged UNO students to undertake a review of the Scottish Rite Masonic Center. Among many excellent recommendations to make the building more inviting, they recommended developing the drab west wall adjoining the parking garage and adding art to the building. The finished mural has numerous Masonic references included for the viewer to discover. The Mural and Garden is a favorite spot for wedding parties photos. Charles Sederstrom, 33°, SGIG in Nebraska, with Curt Edic, 33°, General Secretary, Frank Kroupa, 33°, President of the Omaha Valley Cathedral Board, and Paul Rutherford, 33°, Personal Representative to the SGIG dedicate the Scottish Rite Mural and Garden in October, 2015. The Scottish Rite west garage wall before work was done. Based on their recommendation, the Scottish Rite engaged local artist Charles V. Fisher to design "the Ashlars," which sits in the courtyard and was dedicated in May, 2013. "The Ashlars," represents the rough and perfect ashlars of Masonic symbolism, the journey from man's rough, imperfect state toward a more perfect state. Each man journeys toward perfection through his own faith and in his own way. In 2014, the Scottish Rite dedicated the Grand Cross room, dedicated in memory of Robert A. Falk, 33°, Grand Cross and the four other men in Nebraska to have received the highest honor in Scottish Rite Masonry. The room was painted by Ivo Koytchev and Sandra Lassley of Fe-Fi-Faux studios, and represents a beautiful addition to the Scottish Rite's facilities. Their work was so well-received, they were again retained to suggest something for the unattractive west wall. Engraved bricks are the perfect way to both support the Scottish Rite and recognize you or your loved ones. They suggested several designs, and the garden scene was unanimously chosen by the Cathedral Board. During the Fall, 2015, Ivo worked on the painting, with many passers-by stopping to admire his work. 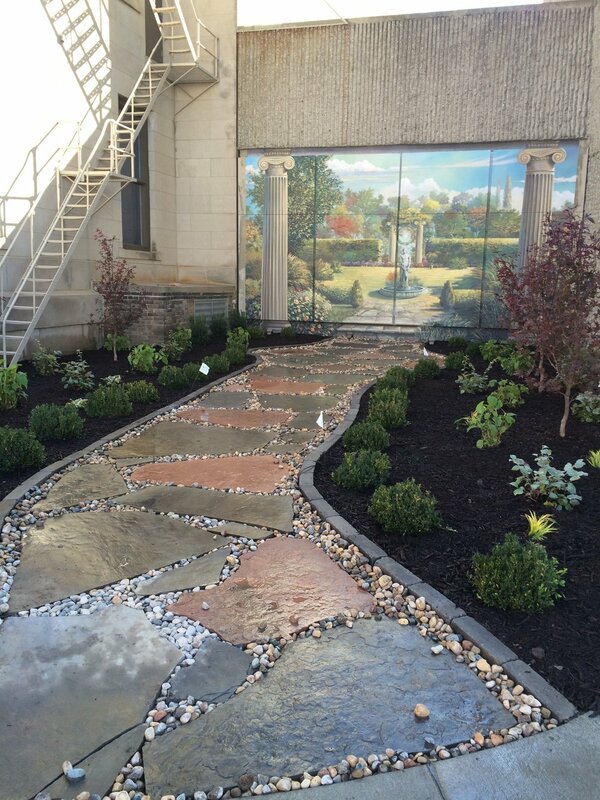 The finished painting was dedicated in October, 2015 by Charles Sederstrom, Curt Edic, Frank Kroupa, and Paul Rutherford, and the garden was landscaped shortly thereafter. The Garden is a favorite area for wedding parties' photos and local residents, who enjoy the shade on a warm day. Click here to download a pledge form toward a brick in the Scottish Rite Garden. The Scottish Rite - originally built on land acquired in 1905, then described as "west of downtown" is definitely part of the fabric of the neighborhood, and guests always admire the beautiful Neo-Classical building finished in 1914. We invite you to support the Garden by the purchase of a Garden brick. With your tax-deductible donation of $1,000, you will be perpetually recognized as a supporter of the Scottish Rite Foundation of Omaha. You can download a pledge form here, or simply make a tax-deductible donation online. The Scottish Rite Development Director will contact you about what you'd like engraved on your brick.